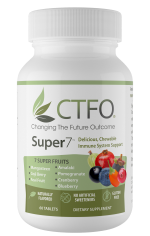 Super7 Immune System Booster – 💗 CTFO, Inc. These statements have not been evaluated by the Food and Drug Administration. This product is not intended to diagnose, treat, cure, or prevent any disease. It is always recommended to consult your physician whenever beginning any weight loss or exercise program.